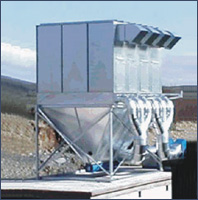 Raj Process is leading Manufacturer and supplier of bag filters in Pune, India. Recovery of particulate matter from exhaust gas is vital for any industry from two aspects. Recovery of finished product increasing the plant yield. The dust-laden air enters the bag filter bustle. The air is uniformly distributed avoiding channeling. Initially a coat of material forms on the bags. Subsequently, the coat acts as the filtering medium. The dust is accumulated on filter elements while the air passes through the filter bags from outside to inside. The accumulated powder is dislodged from the bags by reverse pulse-jet air or by mechanical shaking intermittently. n The dislodged powder falls on bottom cone and is discharged through powder discharge valves. The dust free air is sucked by induced draft fan and is exhausted to atmosphere. Knockers are provided on conical portion especially for sticky/hygroscopic materials. Temperature range from -35°C to 400°C. Tailored to suit customer requirement. Easy removal of bags for cleaning. Various options of filter media to suit the process. Designed to operate at lower pressure drop thus reducing the power requirement. Pulse-jet air cleaning assembly or optionally mechanical shaking arrangement. Air bleeding assembly for over temperature protection. Raj Process - Leading manufacturer and supplier of Allied Products in Pune, India.